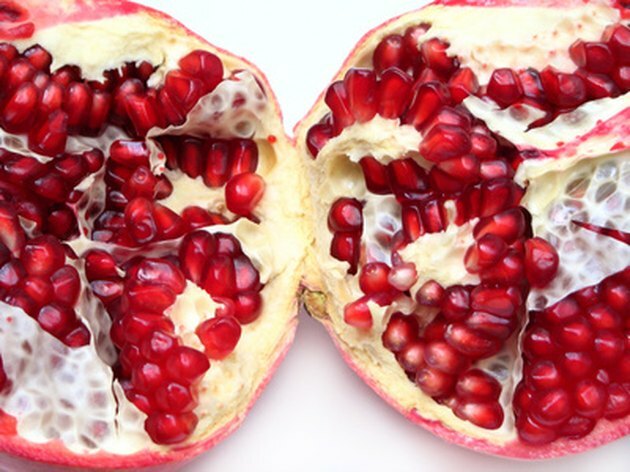 Can You Lower Cholesterol With Pomegranate Juice? The idea of drinking pomegranate juice to lower cholesterol is beginning to get support in medical communities, such as the Mayo Clinic. When answering a question for a reader on MayoClinic.com, medical expert Thomas Behrenbeck, M.D. stated that fruit juices, like pomegranate, contain antioxidants that may help protect your heart by reducing low-density lipoprotein, or LDL, cholesterol. The Mayo Clinic also reports that the pomegranate has more of the lipid fighting antioxidant polyphenol than other forms of fruit. When purchasing pomegranate juice, check the label of the juice drink you select. Look for pure pomegranate juice that is not from concentrate and does not contain fillers, chemicals or extra sugar additives. According to the Mayo Clinic, more sugar adds calories, which is counter-productive to improving heart health. Drink one glass of the pure pomegranate juice in the morning with breakfast. If it is your habit to drink a glass of orange or grapefruit juice every morning, substitute the pomegranate. Try the juice instead an extra cup of coffee. If counting calories, add the juice to your daily tally. Prepare a glass of pomegranate juice as a snack. Use the juice to perk up mid morning or in the afternoon instead of a piece of fruit. Add pomegranate juice to recipes that call for fruit juice. The taste of pomegranate juice is different than other juices, so this will require some trial and error. Start with deserts that use fruit juice. If preparing a recipe that has 1 cup of orange juice, try using pomegranate instead. Cold recipes may be better than cooked items since no research has established if heating will affect the antioxidant properties of the juice. There is no measure of how much juice you should drink to lower cholesterol. Start with one glass a day and add one more over time. Since juice has sugar and calories, it is better not to over consume. Dr. Behrenbeck suggested in his article for The Mayo Clinic that you talk to your doctor before adding pomegranate juice to your diet. This is especially necessary if taking a prescription drug or if on a restricted diet. Even pure pomegranate juice will increase your blood glucose level. It may also interfere with some drugs. Overall, pomegranate juice is a safe choice, but if you have a medical condition it is best to talk to your doctor before making any dietary changes. MayoClinic.com: High Cholesterol: Pomegranate juice: Can It Lower Cholesterol?